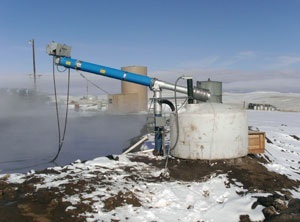 Oil Skimmers, Inc. offers a variety of winterization options that can work with already-installed skimmers to enable your facility to skim oil from wastewater on a continuous basis, all winter long. A 300W heat rod can be added to the Model 6V Brill™ oil skimmer unit, and a 200W pan heater can be equipped for the Model 5H oil skimmer. For mounts with a sludge pan, the pan can be heated with a heat pad to keep recovered oil flowing to the collection vessel. For cantilever or boom mounted skimming systems, the booms can be lined with heat tracing and insulation, and heaters can be added to the spout. Weatherproof junction boxes can be secured at the skimmer point and swivel location on the boom, and insulation can be added, along with a weatherproof cover. If a decanter is used, it can also be furnished with a 300W heat rod. If a sludge pan is used, it can be retrofitted with a 200W pan heater. Being prepared for winter weather conditions is the best way to ensure your facility can continue skimming operations, uninterrupted. Is Your Oil Skimming Equipment Prepared for Cold Weather? To learn more about how to prepare your oil skimming equipment for cold weather and keep it running efficiently, contact Oil Skimmers, Inc. today.